Dyslexia: to cure or not to cure, that is the question! To cure an organic disease means to eliminate the pathogenic agent and its consequences. But what does curing mean when it comes to dysfunctional diseases? The origin of dyslexia is a proprioceptive system dysfunction. In this case, the concepts of cure must be approached differently. We consider that there is a cure whenever the reading function and other associated symptoms become normal. This means the dysfunction may return whenever conditions for a recidivist are created again, but not before. The solution to maintain results is to avoid aggressions to the proprioceptive system. There are precise rules for this. We are teaching those rules. It is a matter of fact that professionals who do not correct the proprioceptive system can't cure dyslexia. They can only hide or compensate some symptoms. Never cure. This is why they are very skeptical about curing dyslexia. Some people say it is good to be dyslexic because many dyslexics have an inventive spirit... We say it's better to not suffer and have a normal lifestyle. Dyslexics ARE suffering and we can help them. Human evolution can't explain this at all because we are only considering a short period of time from the moment dyslexia was first diagnosed, close to a century ago or a little more. What has changed dramatically in a period of a generation, affecting both boys and girls at the same time, is the proprioceptive aggression. And this fact is the origin of dyslexia. This is, in our opinion, a guideline to understanding DYSLEXIA, how to treat it and why some methods are working and some are not. We think it is time to separate the origin from predisponent factors. Anyone can have predisponent factors for a specific disease, i.e. influenza or pneumonia . It would be nonsense to say influenza is a genetic disease... However, many authors are saying DYSLEXIA is genetic! What we can integrate are some predisponent factors but not Dyslexia. Whenever we detect a child in risk to become dyslexic through the study of his/her proprioceptive aggression level, we can reverse this level and this child will never be a dyslexic. We have done it in several occasions. We have never seen a dyslexic without a high proprioceptive aggression level in the last 30 years of our experience in treating dyslexics. There is a kind of pain that is very common. It is a pain where there is no strong evidence of being related to organic lesions. However, this pain is persistent... Backpain, chestpain, plantar pain, sciatic pain during pregnancy... The most common solution for these situations is to prescribe analgesic drugs for long periods of time. However, THIS NOT THE BEST SOLUTION! This kind of pain has a comprehensible reason. It's due to faulty brain information. THE BRAIN IS RECEIVING THE INFORMATION THAT THE MUSCLES ARE TOO RELAXED. Assuming this information as correct, it sends the order to contract the muscle, hence causing the pain. The solution is to correct the proprioceptive information. By doing so, the brain acknowledges the real tonus of each muscle and sends the output to relax. As a consequence, pain diappears in a few minutes. Proprioceptive management techniques are required even in cases of painfull torticolis. Vertigo is not necessarily a consequence of a standing position unbalance. Vertigo can occur in bed or in a sitting position. It results from a wrong perception of the surrounding space. Spatial references are lost during the crisis. The first step is to detect the presence of an organic lesion. However, the majority of the cases of vertigo don't show any significant evidence of organic lesions. The majority of these functional cases are part of the Postural Deficiency Syndrome (PDS) described by Martins da Cunha in 1979. Treatment is very easy and precise for a specialist trained in the proprioception techniques. All that is needed is to treat the PDS, no drugs are needed, only proprioceptive correction. Results are obtained in a few minutes. Common Dyslexia is part of a proprioception dysfunction where cognitive functions are mostly affected. It is never the only symptom. Whenever we use a proprioceptive treatment, associated symptoms also disappear. Associated symptoms usually disappear earlier than dyslexia itself. The cognitive functions need some time of maturation to normalize - a short period of time though - and most people can increase their reading performances in a few weeks. Everything depends on the compliance of the proprioceptive treatment and on the severity of the case as well. The prescription must be correct and compliance overviewed. What is interesting in this new method is that dyslexics only need to come back to the doctor's office once a year and be monitored 4 months after the first visit. Vertigo and unbalance are two conditions that decrease quality of life. They can be related to neurological lesions and labyrinthic health problems. However, many of those suffering from vertigo or unbalance do not show evidence of neurological lesions or labyrinthic organic disturbances. The majority of theses cases is due to a proprioceptive dysfunction. Whenever we correct the proprioceptive system, vertigo and unbalance also disappear in a few seconds. If they do persist however, it means they do not have a proprioceptive origin. Blood vessel muscles are related to the proprioceptive system and that is why sometimes vasodilator drugs can help with vertigo and unbalance. However, this is a weaker part of the proprioceptive system. In order to have the best results, we must use stronger proprioceptive entries like the eyes and/or skeletal muscles, which is the same as saying we must use Active Prisms and Postural Reprogramming. We are using both Active Prisms following MD O. Alves da Silva's requirements and Postural Reprograming according to MD Martins da Cunha. This treatment is the basic approach for every type of proprioceptive dysfunction symptoms. However, some types of symptoms need special action. If we accepted all organic theories about the brain of dyslexics, tests and results would have to verify that the dyslexic would have a very distorted brain (Displaced brain cells, corpus callosum abnormalities, abnormal cortex shape, excess of neural tissue, etc.). This is nonsensical as only the brain dysfunction theory can explain all associated symptoms in the dyslexic. The key for treatment of dyslexia is deep knowledge of proprioceptive system management. This knowledge includes the recognition of proprioceptive symptoms, the diagnosis of the proprioceptive dysfunctions and the management techniques of the proprioceptive system. Active prisms can unblock the brain by using the proprioceptive system, thus allowing the dyslexic to read and write properly and accurately. Brain mapping has shown the kind of modifications that active prisms can induce in the brain. For some functions, it is required some maturation time. See the posts on this site for more information. Lisbon School Techniques - Head by O. Alves da Silva M.D. Eye Surgeon. We consider that dyslexia is cured when the dyslexic person can read as fluently as a regular person. In case there is a new agression to the proprioceptive system, reading difficulties can reappear. To mantain the results, we must protect dyslexic people from proprioceptive agressions at all times. This means the dyslexic needs to inform his/her brain about keeping a proper body position constantly. This doesn't mean dyslexics must keep a correct body position everytime. What it means is the dyslexic must keep the level of proprioceptive agression below his/her level of resistance to the agression. Prisms are necessary until correct body perception is achieved and there isn't a time limit for its use. Our concept of cure is also accurate for every symptom of PDS, including muscular pain and vertigo. Writing of an 11-year old girl suffering from dyslexia, dysgraphia, and dysorthography. The same patient 4 months after our proprioceptive treatment. Brain Mapping of a Dyslexic Child. 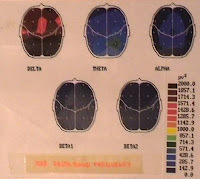 We can observe a very high absolute power in DELTA FREQUENCIES. The same patient 5 minutes after using active prisms while in correct sitting position. Handwork of a Dyslexic child. The same patient after proprioceptive treatment. Depression is currently taken as a psychiatric disease without exceptions. In our practice, we have detected many cases of depression previously treated by psychiatrics with depressive drugs for several years without success. Patients with this kind of suffering usually complain about several associated symptoms such as neck and back pain, unbalance, tiredness, lack of concentration and frequent falls. The objective examination can arise to a diagnosis of Postural Deficiency Syndrome (PDS). After prescribing our treatment for PDS, every symptom disappears including depression. Our prescription, unlike others, does not include anti-depressive drugs but only active prisms and body correction (Postural Reprogramming according to MD Martins da Cunha's Techniques). However, we must emphasize that psychiatric depression cannot be cured using our techniques. We consider to be important to identify these two kinds of depression in order to prescribe the correct treatment for each one. Depression can lead to severe incapacity. Detecting its origin early and starting its treatment as soon as possible is of great value for people suffering from it. Results are achieved very rapidly for the non-psychiatric depression since it is just a symptom of PDS. If this kind of depression is not identified at any point, then patients will be treated as psychiatric patients for a long period of time without any hint of success. Drugs can control the symptoms but they will not eliminate the cause or cure the patient. This system begins with information receivers and it ends with action suppliers. Between these two extremities, there is a complex mechanism. There is an afferent pathway to the brain. Proprioceptive information is received by the brain, it is treated at this level and then submitted to a perceptive mechanism. The disease occurs when the proprioceptive perception is disturbed. Perception depends on the information coming from different receivers and not just from one kind of proprioceptive receiver. Let's consider the perception of verticality. Information comes from the eyes, from the feet, from the inner ears, from antigravitic muscles, from tendons, from fascias and from joint receivers. Suppose these pieces of information are not coherent amongst themselves... the result is unbalance, vertigo or dizziness. As so, these receivers have shown they are intrinsically linked and integrated by a common brain mechanism. That is why they represent a system. The proprioceptive system includes not only the perception of the body but also the perception of the body in space, the EGOCENTRIC LOCALIZATION. It is impossible to understand the consequences of the proprioceptive dysfunctions without this knowledge. The proprioceptive system is a slow neurological system, which means it works with at a low speed in afferent and efferent pathways. Proprioceptive centers receive information from the classical proprioceptive body receivers but also from vision and inner ears. Vision has two kinds of neurological pathways: the well known retina-cortical pathway and the retina-colicular pathway but only this secondary pathway belongs to the system. Low-powered prismatic lenses use this colicular pathwayto reach the brain and manage the proprioceptive system. Usually, Optician Schools are not able to train opticians in setting active prisms. It requires a very specialised know-how and understanding. This kind of glasses must respect oculomotricity rules to be effective. Opticians are usually trained to set passive prisms. The shape of the frame and the method for centering lenses must follow specific rules. The optician is part of the therapeutical team and he/she must be integrated as a working element. Otherwise, the entire work is at risk. Since we are providing the brain with new information, this information must be highly precise. Multifocal lenses represent a hard task for opticians. Setting the prescribed prisms in the correct place, respecting oculomotrocity rules and choosing the correct frame requires deep knowledge and special training. Usual optical lenses only have one main task. It consists of putting a focused image on the retina. Active prisms have a different main task. It is to inform the brain. The technical parameters to be respected are different even from passive prisms. This kind of active prisms needs a frame with a minimum of deepness. For small children, the minimum is 29 mm deep; for other people 30 mm deep; and for multifocals, no less than 32 mm. The frame must be curved and tilted in order to respect the physiology of eye movements. Both temporal fields must be symmetrical, which means the centering rules must be different from the usual. The orbital asymmetry must be taken into consideration. This means new rules for frame adjustment. In conclusion, only a specif training for opticians can guarantee good results. Standard opticians do not possess enough knowledge to prepare glasses with active prismes. They can do it, but the results will not be good because they will be missing the correct rules. Usual school furniture is aggressive on the proprioceptive system. As so, we decided to modify the usual school furniture by use of sloped desks, limb supports and specially-shaped chairs. We studied the attention levels of 2 classes composed of 8-year-old children. In one of them, we used the standard furniture and we equipped the other one with special furniture. The difference in the results for the two classes lead us to conclude that the non aggressive proprioceptive system furniture can increase attention levels. In the same study, we also evaluated the number of spelling mistakes and we observed that, before the special furniture, both classes had the same level of spelling mistakes. 4 months after that, the class equipped with special furniture reduced its mistakes 4 times more than the non-equipped class. We also studied the reading speed and reading ability of both groups. The special-equipped group presented much better results than the non-equipped. 4 months later, we studied both classes and verified that, in the class equipped with our special furniture, there was a reading improvement of 24.4 percent. In the non-equipped class, we verified an increase of only 7 percent, which could easily be due only to the fact that the children were now 4 months older. We have also been studying the reading speed and the spelling mistakes in another school. The first results are showing a very high performance in the group equipped with special furniture when compared to the non-equipped group. The quantifiable results are still in progress. Proprioceptive aggression doesn't harm the intellectual level but it can terribly harm the execution level, which is the main factor of learning disabilities. Some attendees to the San Diego Seminar are asking whether correct standing position is similar for every person or not. Also, they want to know how to assess the short leg situation through a postural point of view. Both legs are symmetrical concerning the medial plan but opposite concerning the antero-posterior body gravity centre. When we put the right leg behind the shoulders, the gravity centre moves forwards. Also, when we put the left leg behind the shoulders, the gravity centre moves backwards. In case of PDS, the body gravity centre is displaced backwards. In order to correct this anomaly, we must put the right leg slightly behind. This is similar for every person. This is true for usual standing position on a flat surface. However, when you bend the leg, i.e. to use the stairs, the opposite is true. When people put their right foot on the stairs, the centre of gravity moves forwards. But when people put their left foot on the stairs, the shoulder and the body gravity centre moves backwards. The majority of short legs are not actual short legs, they are the consequence of asymmetrical muscular tonus. It is a mistake to put a single compensation insole under the short leg because it increases the pression on this limb and enhances the muscle tonus's asymmetry. There are several types of treatment which must be used concurrently. The aim of the first 3 methods is to correct the proprioceptive system. Its dysfunction is on the origin of dyslexia and of many other symptoms like unbalance and muscle pain. The aim of the fourth method is to sustain the results. Wrong posture produces proprioceptive dysfunctions. The aim of the fifth method is to stimulate the affected brain areas. In conclusion, for an effective treatment we need to correct the proprioceptive system, rehabilitate the affected areas and avoid proprioceptive aggressions in the future. We emphazise that in the majority of the cases we don't need cognitive training. However, the others 4 items must be observed. The proprioceptive correction is made at home by the children under parent's supervision. Every symptom disappear with this treatment and not just dyslexia. Chronic tiredness, hyperactivity and lack of attention are part of the associated symptoms. Active prisms are conceived as a means to enter the proprioceptive system, using the eyes to reach the brain. These prisms are not conceived to correct eye deviations as the usual prisms. Their purpose is to influence the brain proprioceptive centers and modify the proprioceptive output. They are low-powered and prescribed according to the relaxation axis of a specific eye muscle. Active prisms are not prescribed by "trial and error" techniques but according to specific procedures. The authors who have shown success in treating dyslexia are those who are using proprioceptive entries for treatment. Many of them still ignore which exact entries they are using and they are searching for explanations that still remain inconsistent. However, everything is very easy to explain for researchers that have a deep knowledge of the proprioceptive system: Balance and eye movement are related to the proprioceptive system. Results can be improved if a correct and systematic management is performed. In dyslexics, the neutral balance between agonist and antagonist muscles is not in the zero position. Balance training can help by reestablishing the zero position and providing a new proprioceptive input to the brain. This is the reason why balance training can help curing dyslexia. However, this is an incomplete treatment. Many other proprioceptive entries must be managed in order to obtain excellent results. Only smooth balance is integrated in the proprioceptive system and cerebellum theory must be reviewed. Reading disability is not the only symptom in dyslexics. Are these symptoms associated or are they symptoms of a syndrome where dyslexia is included? In 1979, Martins Da Cunha included DYSLEXIA in the Postural Defficiency Syndrome (PDS). We know PDS is a consequence of a proprioceptive system dysfunction. We also know that reading disability disappears under specific PDS treatment. PDS is not a mechanic body distortion but an unconscious wrong body position due to faulty proprioceptive brain information. Wrong body position is just the tip of the iceberg regarding PDS. Cognitive dysfunctions, pain, unbalance, convergency insufficiency, hearing perception delay, and wrong space localization are only some of PDS's clinical manifestations. Our very long practice has shown that we can treat dyslexia by using the same technique used to treat PDS without dyslexia. This means that Developmental Dyslexia is a PDS condition where cognitive dysfunctions, including reading disabiltiy, are dominant symptoms. However, common dyslexia presents other symptoms besides reading disabilities, such as tiredness or hiperactivity, dysgraphia, dyscalculia, dysorthography, hearing delay perception, frequent falling, limb muscular pain, eye convergency insufficiency, balance difficulties, motor coordination difficulties and many other associated symptoms. Raising the hypothesis of brain lesion would lead to the conclusion that widepread and multiple brain areas must present lesions. This is not the case as no study was able to find areas of multiple and wide brain lesions. Nonetheless, reading difficulties have increased 3-fold from 1960 to 1990. Organic hypothesis fail to explain this fact. Some authors argue that this is due to a better ability to detect dyslexia. However, these values are not related to dyslexia detected by specialists but rather to reading difficulties detected by teachers among their students. It is a matter of fact that postural aggression leading to proprioceptive dysfuncion increased during this elapsed time. In our opinion, this is the real reason for the high number of dyslexic children nowadays. Brain mapping of these children shows widespread areas with absolute power high levels in the brain. These areas return to normal after our proprioceptive treatment. THIS EVIDENCE EXPLAINS THE MULTIPLE ASSOCIATED SYMPTOMS and it also explains why the number of cases keeps increasing. Through literature review, we verified that some techniques leading to better reading ability have also been described. Apparently, each technique is using a different mechanism and this creates some confusion about how it works. Our knowledge enabled us to understand that all these techniques leading to a progress in reading abilty - even though their authors ignore it - are using a proprioceptive entry. Our clinical experience makes us confident that the management of a single proprioceptive entry is not enough to achieve good results and it only allows to obtain weak results. We also know that the strongest proprioceptive pathway to treat dyslexia is the trigeminal pathway. Proprioceptive Dysfunctions may lead to Postural Deficiency Syndrome (PDS) described by H.Martins da Cunha, MD in 1977. Martins da Cunha described several kinds of symptoms with the most relevant being Pain, Unbalance, and Cognitive Dysfunctions. Pain includes back pain, neck pain, high pain torticolis, brachialgia, chest pain, limb pain, hyperalgia and migraine. Cognitive Dysfunction includes dyslexia, dysgraphia, dysorthographia, lack of attention and hiperactivity. Vascular dysfunctions like Reynaud Syndrome, cold extremities (even in summer time), narrowing between high and low arterial pressure, and asymmetrical blood supply without arterial lesions are also important symptoms which lead patients to search for medical help. The sense of body localization is disturbed, patients bite involuntarily their inner mouth, they fall down without evident reason, they lose sense of orientation, they run into doors and furniture at home, and they can't walk straight with their eyes closed. These symptoms are not present in every patient but in a significant part of them. Whatever the type of symptom the patient presents, all are eliminated by the same treatment. The symptoms change for every individual but the type of treatment does not. Only the details are different but not according to the symptoms but to the type of PDS. This means we can use the same treatment for cognitive dysfunction, back pain or vertigo and different treatment details for two cases of similar back pain. Lisbon, Portugal. 6-7th June 2008 (Advanced Course in Proprioception at Lisbon's High Orthoptic School). Proprioception is our sixth sense. It informs the brain about the body itself and the relationship between body and space. Proprioception is the first part, the afferent part, of the PROPRIOCEPTIVE SYSTEM. This is a complete neurological system that includes receiving and processing information brain centers, efferent neurological pathways and effector organs, a feedback mechanism that is associated. Common Dyslexia is a consequence of a proprioceptive dysfunction. The good news is the body has the necessary know-how to normalize the proprioceptive dysfunction and improve reading ability as well as other associated symptoms. We are using ACTIVE PRISMS and other complementary treatments. Complementary treatments include specific motor coordination training developed by Martins Da Cunha, MD that was named Postural Reprogramming. The reason why some types of motor training can improve reading ability is that they can interfere with the regulation of the proprioceptive system. Reading our work, the authors of some motor coordination trainings will finally understand why their treatment increase, although slightly, reading ability... However, Active Prisms are the strongest component for dyslexia treatment and the results appear in a short period of time, even in severe cases. Active prisms are not yoked prisms but prisms prescribed according to previous proprioceptive status evaluation by use of specific techniques. Each type of proprioceptive dysfunction requires a specific active prism. What is new is the confirmation that common DYSLEXIA is not a disease but just one of the PDS's symptoms. The main benefit is that we can treat Dyslexia by treating the proprioceptive dysfunction which produces all PDS symptoms, including Dyslexia. Many kinds of pain and unbalance don't need drugs to be treated but only the techniques to correct proprioceptive system dysfunctions. These techniques are neither iatrogenic nor invasive. Our experience dates back to 1977 and we have treated more than 30 thousand patients with success. This represents a very long background and a very high number of patients treated. The classical treatment for Dyslexia has a low percentage of good results because its aim is to reduce the symptom but not to eliminate the origin of the disease. The same goes for some kinds of pain that are only due to muscle contracture arising from wrong brain proprioceptive information. Everytime the brain is informed the muscles are too relaxed, it sends the neurological output to normalize their tonus. But if this information is wrong - as in the case of a proprioceptive dysfunction - the brain sends a similar neurological output, the muscle contracts and reaches the pain level. This is very common and we estimate, according to our experience, it affects more than 10 per cent of the adult population in industrialized countries. Many muscle pains are found not to have an evident organic origin. The body's balance system is also affected by wrong proprioceptive information. The brain doesn't know where the body segments and space are exactly located and it keeps sending wrong neurological outputs which lead to unbalance. In case of dyslexia, what is affected are the brain centres that locate exactly the components of the written message and also the position of the eyes relative to each part of the text. Whenever a "DE" is seen as a "ED" or a "p" is seen as a "q" or the line above is seen as the line below, the text stops making sense and people can't read . However, when we correct this wrong perception through the correction of the proprioceptive system, reading becomes possible and easy. In case of proprioceptive dysfunctions, including dyslexia, Brain Mapping (computerized electroencephalography) shows excessive brain cortical absolut power in the low-frequency waves. When we correct this system using our methods, these excessive brain cortical levels become normal. In case of pain or unbalance, this is enough to make those symptoms disappear; in case of cognitive dysfunctions, we have the basis to continue the treatment by cognitive training. However,we emphasize that, in many cases of dyslexia, cognitive training is not necessary. Pioneer In Opthalmologic Proprioception since 1977 with H. Martins da Cunha, MD, who first published the Postural deficiency Syndrome (PDS) in 1979. O. Alves da Silva developed the method to prescribe ACTIVE PRISMS and influence the brain proprioceptive centers and output. He also developed postural reprogramming techniques, cognitive training and ergonomics, which combined with active prims successfully cure proprioceptive dysfunctions associated with certain types of dyslexia, vertigo and muscular pain symptoms. Since 1977, Alves da Silva has successfully treated approximately 30,000 cases of dyslexia, vertigo and muscular pain. Head of the Strabismus Department (1977-2005) of Santa Maria University Hospital - LISBON - PORTUGAL.Professor of Ocular Motricity at School of Orthoptics- Lisbon. 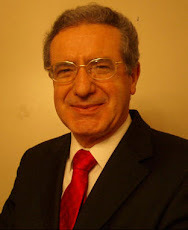 President and Founder of the Portuguese Association of Clinical Posturology and Dyslexia. Founder and First President of the Portuguese Group of Pediatric Ophthalmology and Strabismus. Guest speaker at several scientific international meetings on Proprioception.